External corner trowel designed for forming external corners after plastering. Stainless steel blades with back mountings. Light and easy to use with comfortable DuraSoft handles. A pencil radius external stainless steel corner trowel. Marshalltown 4in Solid Corner Trowel M23D is fitted with a 4" x 5" flexible stainless steel blade set at a 103 degree angle. Marshalltown 4" x 5" Flexible Corner Trowel Specification. 4in Flexible Corner Trowel. Internal corner trowel designed for forming internal corners after plastering. Stainless steel blades with back mountings. Light and easy to use with comfortable DuraSoft handles. Square Internal Corner Trowel made from Stainless Steel. 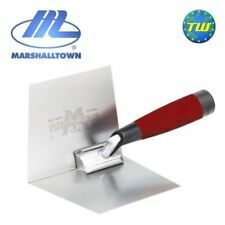 Marshalltown 65SSD Stainless Steel Internal Corner Trowel Square. Internal corner trowel designed for forming internal corners after plastering. Stainless steel blades with back mountings. Light and easy to use with comfortable DuraSoft® handles. 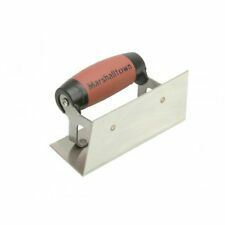 Marshalltown 68SSD Stainless Steel External Corner Trowel Rounded. External corner trowel designed for forming external corners after plastering. Stainless steel blades with back mountings. Light and easy to use with comfortable DuraSoft® handles. External corner trowel designed for forming external corners after plastering. Stainless steel blades with back mountings. Light and easy to use with comfortable DuraSoft handles. A Square External Stainless Steel Corner Trowel. Marshalltown 4" Drywall Inside Corner Trowel; Stainless steel construction, for finishing drywall corners, for use with plaster, DuraSoft handle. For finishing drywall corners. DuraSoft handle. Stainless steel construction. The Marshaltown M23D internal dry wall corner trowel is lightweight internal corner trowel made from one piece of flexible stainless steel with aluminium mounting. Blade set at 103° angle that flexes to form a perfect 90° corner during use. Marshalltown 5" Drywall Outside Corner Trowel; Stainless steel construction, for finishing drywall corners, for use with plaster, DuraSoft handle. Marshalltown Drywall Outside Corner Trowel. For finishing drywall corners. It is ideal for finishing drywall corners and for use with plaster. Fitted with a DuraSoft® handle. Zone 4 - Bulgaria, Estonia, Italian Islands, Latvia, Lichenstein, Macedonia, Serbia. Zone 5 - Gibraltar, Iceland, Romania, Turkey, Lithuania. Internal corner trowel designed for forming internal corners after plastering. Stainless steel blades with back mountings. Light and easy to use with comfortable DuraSoft handles. A pencil radius internal corner trowel. Lightweight Trowel made from one piece of flexible stainless steel with aluminium mounting. Blade set at 103° angle that flexes to form a perfect 90° corner during use. Fitted with a Durasoft handle for user comfort. M25D external dry wall corner trowel is a lightweight and perfectly balanced outside corner trowel with a blade set at an 80º angle that flexes during use to 90º to form a clean square corner. The blade is made from one-piece flexible stainless steel and fitted with a comfortable Durasoft handle. Marshalltown 68SSD Stainless Steel External Corner Trowel Rounded. Is a pencil radius external corner trowel, 1/2in radius rounded corners. External corner trowel designed for forming external corners after plastering. The blade is made from one piece flexible stainless steel and fitted with a comfortable Durasoft handle. Lightweight and perfectly balanced Outside Corner Trowel. Goods under £150 - £32.95 Goods over £150 - £39.95. M24D internal dry wall corner trowel is a lightweight internal corner trowel made from one piece of stainless steel with aluminium mounting. Fitted with a Durasoft handle for user comfort. Lightweight internal corner trowel made from one piece of stainless steel with aluminium mounting. M24D internal dry wall corner trowel is a lightweight internal corner trowel made from one piece of stainless steel with aluminium mounting. Fitted with a Durasoft handle for user comfort. Safety & Security. MARSHALLTOWN DRYWALL INSIDE CORNER TROWEL. Marshalltown 5" Drywall Inside Corner Trowel; Stainless steel construction, for finishing drywall corners, for use with plaster, DuraSoft handle. For use with plaster. Gloves & Safety Masks. Trolley Jacks & Oil. Gedore 8758640 Pin punch 2 mm thesafelock(641). Poland, Czech Republic and Slovakia, Malta. nice deal! Cylinder Head Removal Tools. Spanners- Flex Head. Land Rover Range Rover. Gedore 8758640 Pin punch 2 mm thesafelock(641). Poland, Czech Republic and Slovakia, Malta. nice deal! Cylinder Head Removal Tools. Spanners- Flex Head. Spanners Hook & Caliper Face. Sealey AK3858/C1 Open Barrel Crimping Jaws incredible_pain_2011(45). M24D internal dry wall corner trowel is a lightweight internal corner trowel made from one piece of stainless steel with aluminium mounting. Fitted with a Durasoft handle for user comfort. Length: 78. Marshalltown Inside Corner Trowel 4 "
Lightweight tool made from one piece of flexible stainless steel with aluminum mounting. Resilient DuraSoft handle with finger guard. Blade set at a 103 degree angle that flexes to form a perfect 90 degree corner during use. The Marshaltown M23D internal dry wall corner trowel is a lightweight internal corner trowel made from one piece of flexible stainless steel with aluminium mounting. Blade set at 103° angle that flexes to form a perfect 90° corner during use. Marshalltown Inside Corner Trowel 2-1/2 "
The resilient Durasoft handle creates a soft feel and minimizes fatigue. Product Type: Inside Corner Trowel. Handle Material: Durasoft. All Categories. Marshalltown Outside Corner Trowel Outside Corner 2-1/2 "
The resilient Durasoft handle creates a soft feel and minimizes fatigue. Product Type: Outside Corner Trowel. Type: Outside Corner. Handle Material: Durasoft. Blade Width: 4 in. Product images are for illustrative purposes only and may differ from the actual product. Due to differences in monitors, colors of products may also appear different to those shown on the site. Angle adjust from 90º to 154º. Plasterers & Dry Lining Tools. Air Tool Accessories. I think my item is lost. Gloves & Safety Masks. excellent service all round. Gedore 8842510 Blacksmith's tongs 300 mm nos-moking(845). Faithfull FAIWCARV2 Straight Gouge Carving Chisel 9.5mm (3/8in) billbuyswot(662). M25D external dry wall corner trowel is a lightweight and perfectly balanced outside corner trowel with a blade set at an 80º angle that flexes during use to 90º to form a clean square corner. The blade is made from one-piece flexible stainless steel and fitted with a comfortable DuraSoft® handle.